I’ve been craving for a dish of Cagayan’s pancit batil patong ever since sampling an overflowing bowl of the said pancit at Tuguegarao City’s sidewalks. Unfortunately, that’s is ten hours away from where I live; so the next best thing is to find a restaurant that serves the same pancit without having to ride all the way to Cagayan. After asking around, a fellow traveler recommended a place in Pasig City that serves all sorts of pancits from all over the Philippines, Pasig Kapitolyo’s aptly named Pancit Center. 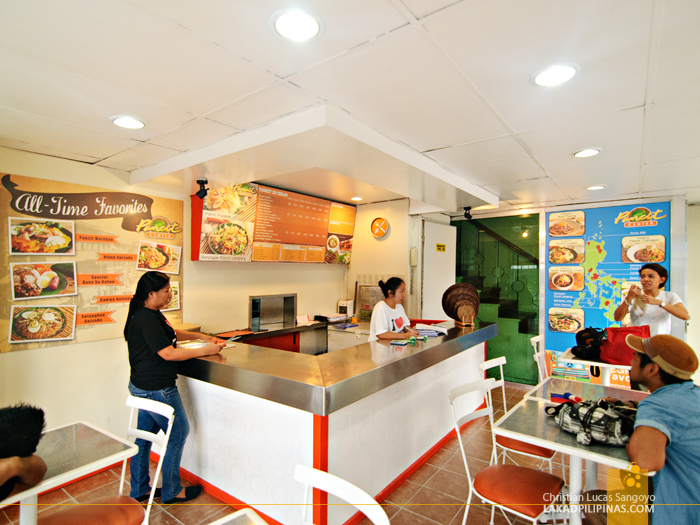 The Pancit Center is just a few minute’s walk from EDSA-Shaw Boulevard (turn right at Shaw if you’re EDSA northbound). Unlike traditional panciterias, the place is housed in a decent building with air-conditioning to boot. The interiors are clean and a restroom is available for pee breaks (not that they serve beer, although I wish they do). The interiors are barraged with pictures of pancits from all over the country. 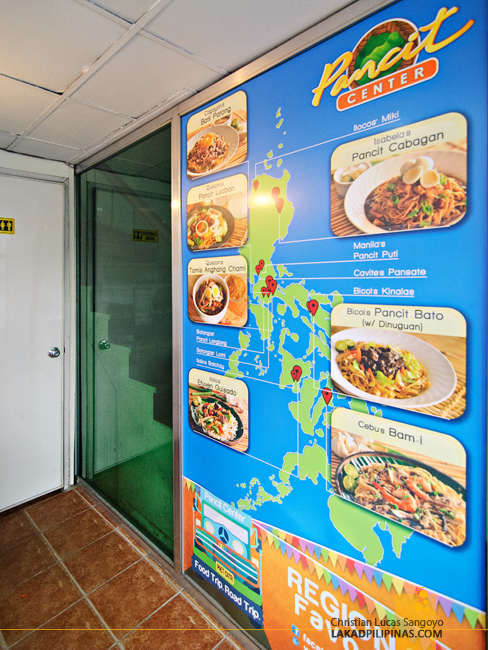 One wall even has a map of the Philippines with pins as to where the dishes originate from. As of last count, they have a total of eighteen pancit dishes to choose from, plus an assortment of other regional fares like puto, lumpia and lechon kawali to name a few. I was with a group of travel bloggers on my initial visit and we decided to each order different pancits and share everything so we can taste every dish. Serving sizes are divided into solos (Php50.00 to Php70.00) and juniors (Php120.00 to Php140.00) (bilao sizes are also available for take outs). We decided that solo servings are enough. We donned our pretend food blogger hats and let the Pancit Center taste test begin. First on our table is their Chicken Mami. 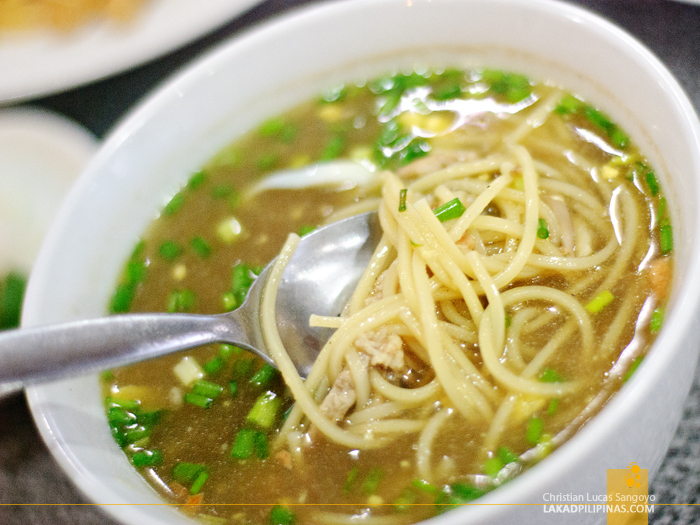 While not really considered as a pancit but a soup, we decided to include it on our fare because, well, just because we liked to. The mami was an instant hit with everyone; the soup was really tasty but not overpoweringly so. The noodle’s firmness was right on. Everyone agreed it was excellent and I even ventured to say that it’s one of the best one I’ve had. 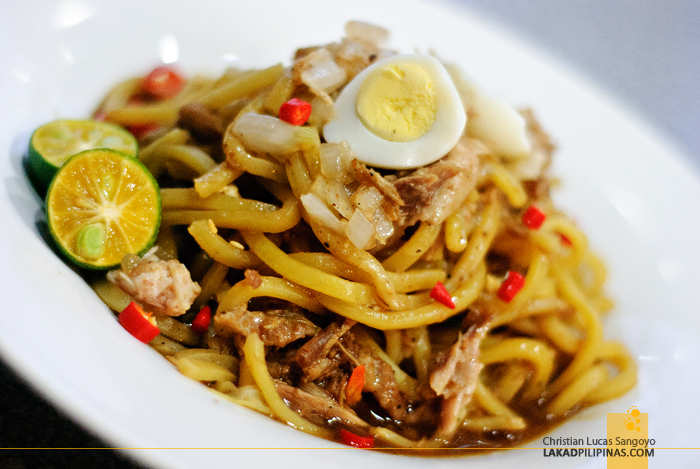 Next up was the eagerly awaited Pancit Batil Patong from Tuguegarao City. 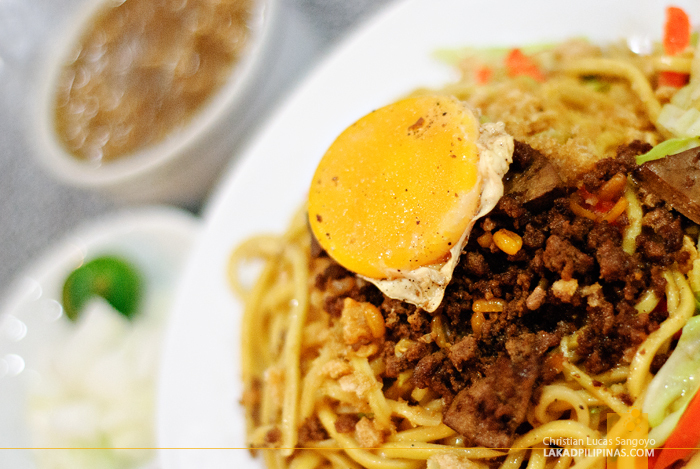 It’s made from Cabagan noodles and topped with crushed chicharon, carabao meat and poached egg among other things. 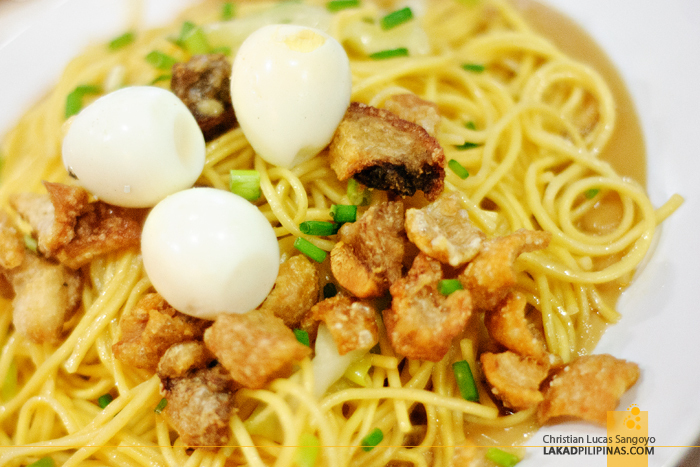 Like its original, Pancit Center’s version also has a side dish of soup (batil) and onions. Unfortunately, that’s where the similarities ended. The taste was nowhere near the original from Tuguegarao, it didn’t even taste half as good. The batil was also too salty, which shouldn’t be the case. The dish received divided reviews from us. Two liked it (they haven’t tried the original) and two didn’t, including me. Empty plates were moved and a new dish was placed on the center table; it’s Quezon’s Tamis Anghang Chami. 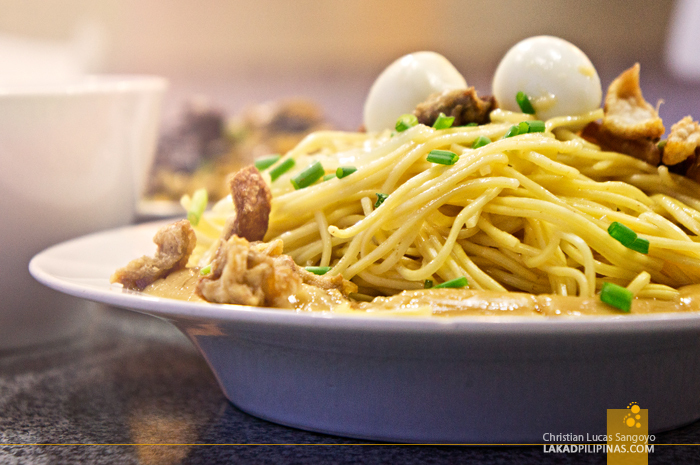 The noodles are thick and are blended with red hot chili, onions, some pork bits and a slice of quail eggs on top. While all of us haven’t tasted the original version of this pancit, everyone agreed that it was good. The combination of sweetness and spiciness worked really well with the noodles. 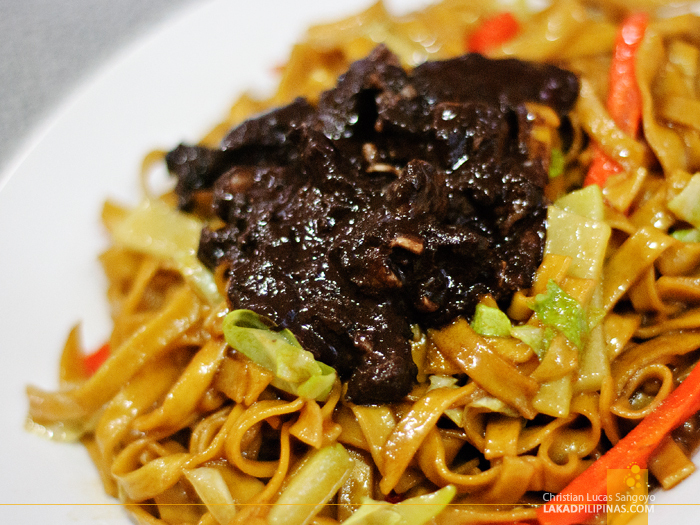 Excited by the previous pancit, we immediately set Bicol’s Pancit Bato with Dinuguan on the table. Now this is one weird pancit, never in my wildest imagination would I pair dinuguan with pancit, and yet here it is. We all warily took a portion and let ten seconds of tasting move past before handing a verdict out. Only one of us loved it, but loved it so passionately that I tried it again; well, I still didn’t like it. Last on our table was Isabela’s Pancit Cabagan. Made from the same noodle as Pancit Batil Patong, it’s mixed with some sort of whitish sauce and is topped by crunchy pork bits, spring onions and quail eggs. One of us has already tried this dish before and she said it looked different from the original, the real McCoy having more sauce than what was served on our table. Portions were served and ten seconds of chewing passed. The verdict; only one of us liked it. We were really disappointed with this one since everyone was really looking forward to this pancit, it looked really appetizing. Before convening our Pancit Center informal taste test, we each had a serving of their puto. I’m not really a puto person but I gave it a try. The bun was not that soft, in fact, crumbly. It tasted very average. Everyone agreed with me except one. Our bill totaled at around Php500.00 (inclusive of two 1.5 liters of softdrinks). Not bad if you ask me, that’s just around Php125.00 each and yet we get to taste four regional pancits, one soup, a plate of puto and a single serving of lumpiang ubod. Although we mostly gave mixed reviews on Pancit Center’s dishes, we still enjoyed each one like it’s the original. Four pancits down, fourteen more to try on our next visit. Hmm I lived in Pasig for over 2 yrs but never heard of this really. So thanks I will definitely check this out when on my off. Wanna try this kaso malayo ba to sa MRT shaw? Eh sa I like everything eh! Hmph. I've been to Kapitolyo several times now, but I haven't come across Pancit Center yet. Sad na di lahat masarap, but I'd still love to give this a try. :) I'm a pancit and puto person! Hihi! I am a netive of Tuguegarao and I already tried their Batil Patung. Sad to say, I am not satisfied with it. 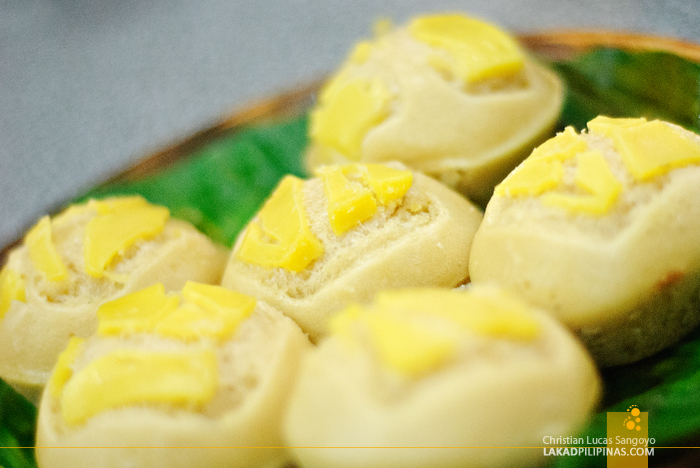 I have tried the BRUNO's Panceteria in Kamuning and this is the nearest taste that a REAL BATIL PATUNG Has. this is more authentic than that of the Pansit Center. Just my opinion. Nothing personal. 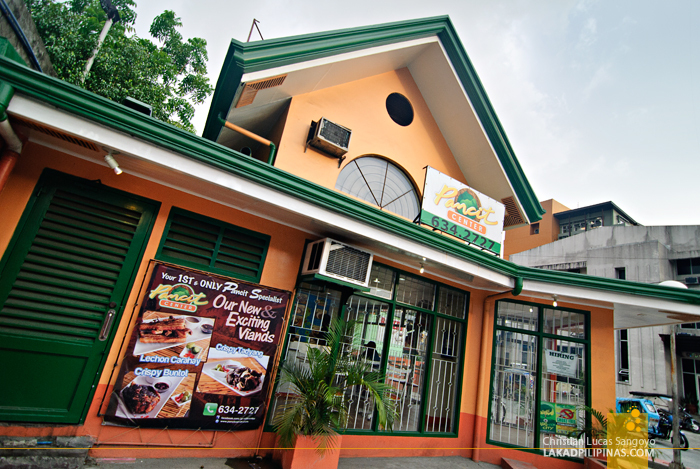 Theres one panciteria at e.rodriguez sr. Ave. Near thomas morato. Almost taste the same as tuguegarao 's pancit batil patong. ano po ung best pancit nila? i was born and raised in Bicol and i love pansit bato by heart but i do not ever recall eating it with DINUGUAN.... i have not seen it done , cooked that way in my hometown.